Marvellous motors: Porsche 718 Cayman T and oxster T.
Whether it’s a lavish Christmas lunch or a special celebration to see in 2018, Jumeirah has an unparalleled range of restaurants and bars to cater to you, your friends and family. Celebrate the festive season in style at the vibrant Scape Restaurant and Lounge. 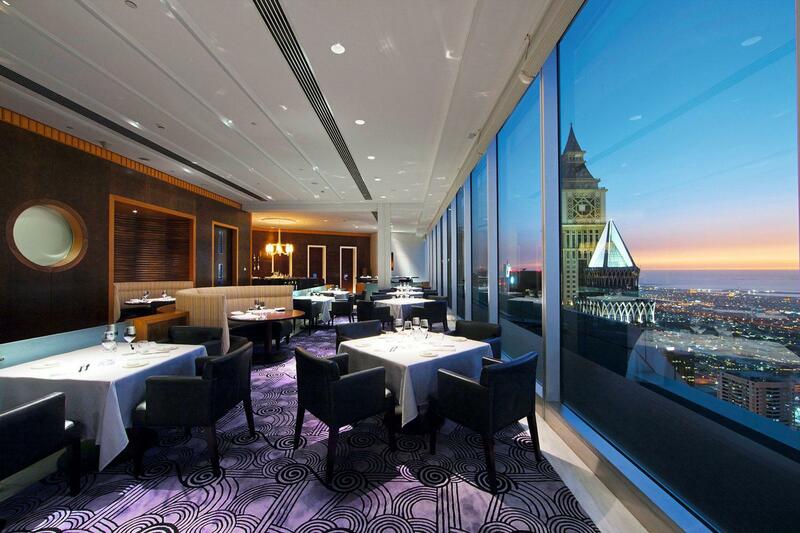 You can drink in the stunning panoramic views of Dubai as you tuck into signature Californian fusion cuisine. When: December 25, 12pm-3.30pm (á la carte lunch), 6pm-11pm (á la carte or four-course dinner). The award-winning British gastropub is doing things in a traditional UK style for Christmas, which means delicious Norfolk turkey with all the trimmings, premium roasts and a selection of accompaniments to enjoy. There’s an excellent terrace area, too, with sensational views of Burj Al Arab Jumeirah. The meat lover’s paradise will join Arboretum and Al Hambra for an all-encompassing Christmas Day brunch at Al Qasr. The American meatery will be serving up its famous cuts alongside more traditional Christmas favourites. Add a little Mexican flair to your Christmas Eve celebrations at Tortuga this year with a selection of foods that break away from the turkey-heavy cuisine usually on offer. There will be live music from the mariachi and salsa bands, too. For a refined approach to Christmas Day brunch, look no further than the exquisite Imperium restaurant. It’s going all out with its quality foods included in what’s billed as, the ultimate international buffet. the perfect spot for guests to sample a Christmas Day that will take in many traditions and fare. Experience a special brunch designed to spread the cheer of the season. From turkey stations and succulent carvery to seasonal desserts and beverages, everyone will find their festive favourites here. An exceptional tea in the clouds experience as you’re invited to embrace the height of luxury. Enjoy an afternoon of specially crafted beverages as you admire the incredible views of the glittering Dubai skyline. Extend your Christmas Day agenda as Indian restaurant Naya offers bold flavours with a fantastic menu. With a Christmas selection that moves away from roast dinners, you can take in spices and vibrant aromas instead. Rib Room’s sophisticated festive menu offers an exquisite selection of succulent grilled meats, prepared to your exact preference. A classy affair awaits you and your close ones this season. Add a hint of grandeur to your celebrations with the sensational spectrum of food in the Sultan’s Lounge. Sip our seasonal afternoon tea and marvel at the life-size gingerbread house. The journey to the Ming Dynasty continues all throughout the festive season. Celebrate Christmas while enjoying Dubai’s quintessential oriental experience with family and friends at Zheng He’s, with its lavish interiors and relaxed, waterside setting. When: December 24: 6.30pm-11pm; December 25: 12.30-4pm. Discover a refreshing Christmas dining experience with a laid-back yet refined feel that packs in an incredible selection of international dishes and festive favourites in the heart of Jumeirah Al Naseem. With a relaxed ambience across its open terraces that offers stunning views of Burj Al Arab Jumeirah, The Palmery will provide a memorable Christmas experience for your friends and loved ones. Savour a dazzling take on this year’s festivities with festive menus of the finest Italian cuisine, complemented by some of the city’s most stunning views from atop Jumeirah Emirates Towers. When: December 22: 1pm-3pm; December 24: 6.30pm-11pm, December 25: 1pm-3pm. The Hide is the ultimate American meatery in Dubai and this festive season will be joining Jumeirah Al Qasr’s grand festive celebrations. Guests are invited to indulge in a unique dining experience that’s tailored for meat lovers. Dig into prime-cuts and American Christmas favourites with a special menu curated especially for Christmas Eve and wonderful live stations at the Al Qasr brunch on Christmas Day. This is the destination for all fans of roasts. It doesn’t matter if you’re flying for the holidays, Jumeirah Hotels & Resorts are having a “not your normal” 12 day celebration with festive specials at 35 of their signature restaurants. Enjoy a three-course festive feast at restaurants including Scape at Burj Al Arab Jumeirah, Rockfish at Jumeirah Al Naseem and more! This is a coveted spot to watch one of the world’s best New Year’s Eve firework displays. The ornately decorated Koubba Bar is nestled within the regal Jumeirah Al Qasr and with indoor and outdoor seating, a shisha terrace and entertainment, this is the place to be for 2017’s finale. Celebrate on the shore of Dubai at Beach Lounge, with its views of the spectacular Burj Al Arab fireworks as you dine on delicious canapes. The party doesn’t stop there though as you’ll be able to dance your way into 2018 with an eclectic DJ set. With views of the Madinat Jumeirah waterways and the majestic Burj Al Arab Jumeirah, it’s hard to imagine a place that offers a more picturesque setting for 2017’s swan song. Situated on Level 50, Alta Badia is the perfect place to enjoy the New Year’s Eve festivities. Enjoy a four-course selection of authentic Italian dishes in an elegant ambience. Dhow & Anchor are doing things the English way this New Year’s Eve and invite you to dig into a family-style carvery menu with your mates and close ones. With live entertainment setting the tone for the last night of the year, your celebration can’t be any better. Enjoy a lavish family-style dinner spread, impeccably presented like a traditional Chinese feast. From colourful dim sums to intricate oriental creations, this will be a culinary voyage to savour right before you enjoy the after party of the year at Shimmers. This is a gala dinner that you will want to savour every moment of. It has an upbeat atmosphere and serves only the best of dishes. From oysters, sushi and lobster to carvery and mouth-watering desserts, you’ll get to end the year on the sweetest of notes.